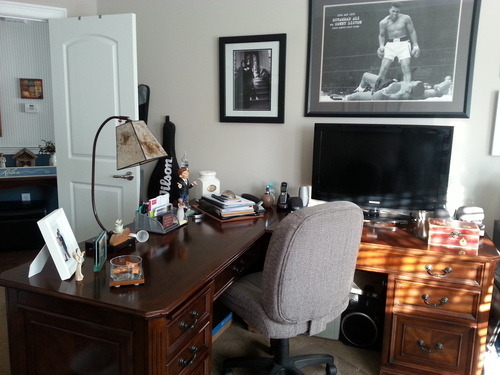 The Desk…….and of course his idol Mohamed Ali………. This is the chair we both want to sit in at the same time. 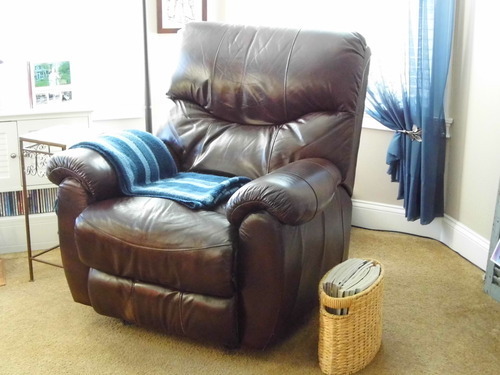 – I love this chair. So comfortable. 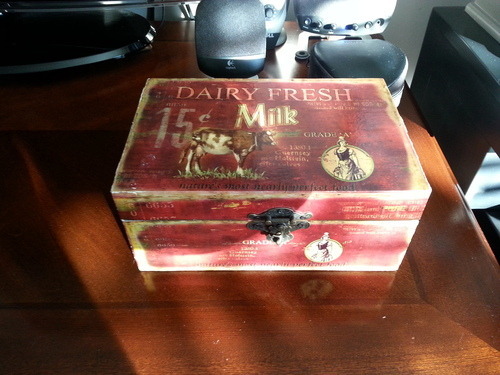 This is a good story – a friend gave the crate to me. I loved it, but it was not functional – I wanted a piece of glass for the top, but Pete had another idea. 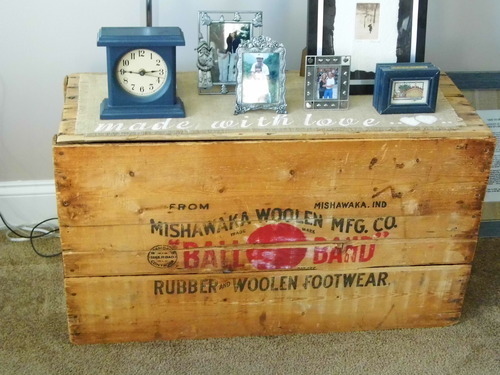 He took the entire front apart, turned the crate upside down put the front of the crate back slat by slat – I now have a top to display a few pictures and a small light. 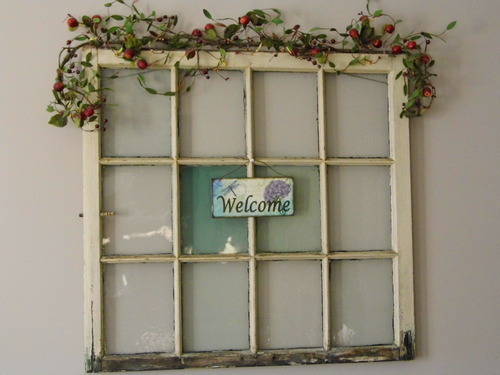 I had my eye on this window for almost a year – it was outside against an old shed down the road from where I live. I wanted to ask the person who lived at this house if I could have it – never got up enough nerve to do it. One day when passing by – I noticed the window was gone. I was so upset – told Pete about it, he felt bad for me too. Pete proceeded to go to the person’s house – and mentioned about the window, (Matt) said he had a few in his basement, went to get them and said to take two, and give them to me as a Christmas gift. Pete’s intention was to do just that – he wanted to surprise me. Now I have 2 old windows in my home. I love them – I love you hun for always thinking about me. I purchased this old shutter at an antique shop in Pennsylvania. 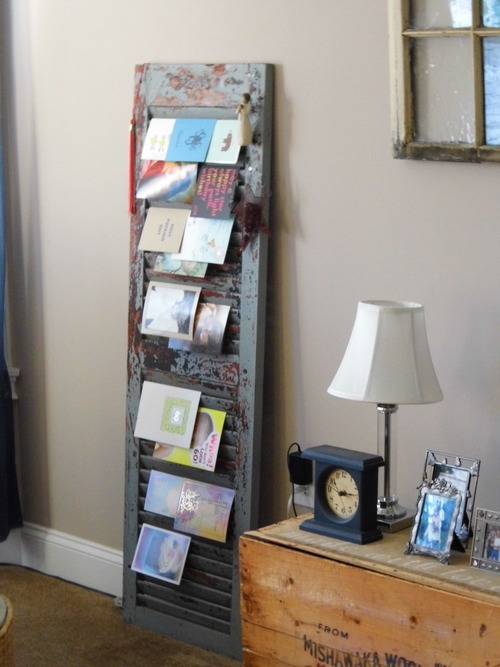 Perfect for those card you just can’t toss away. 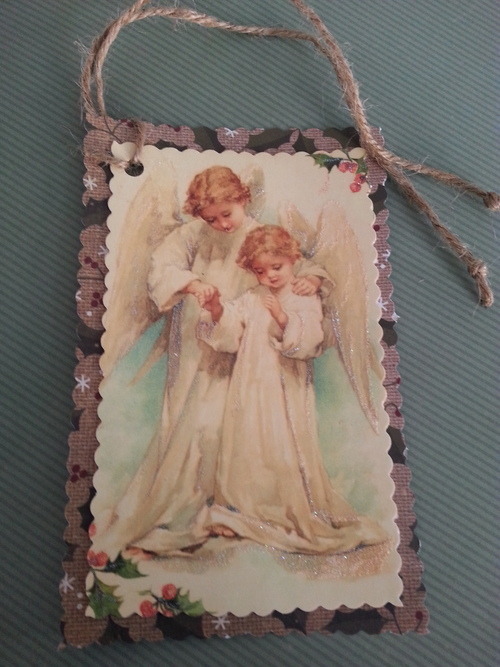 She reminded me of how our Nana would use the old Christmas cards from the year before, and make Christmas tags for her gifts the following year. 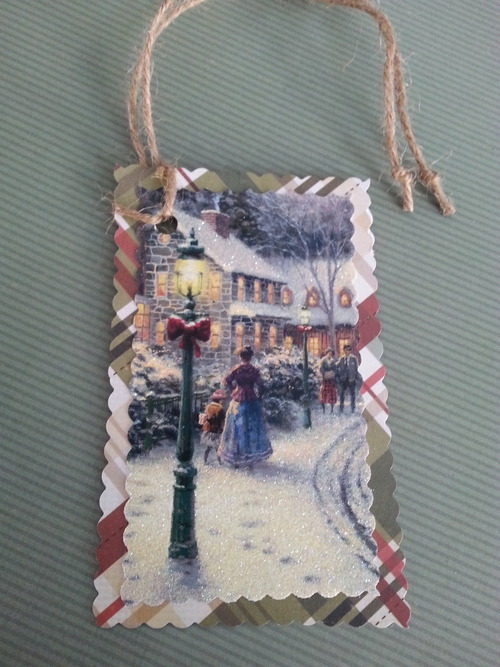 So here is my take on Nana’s tags…..
As you can see I used small sections from each card. 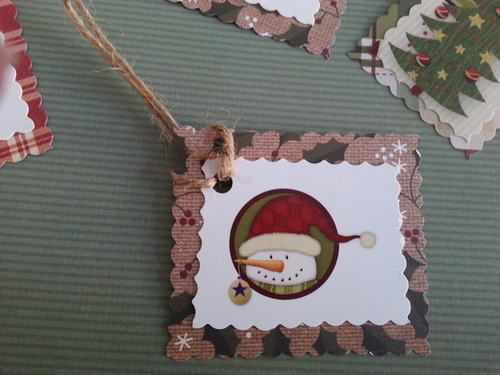 The little snowman is from the back of a card. 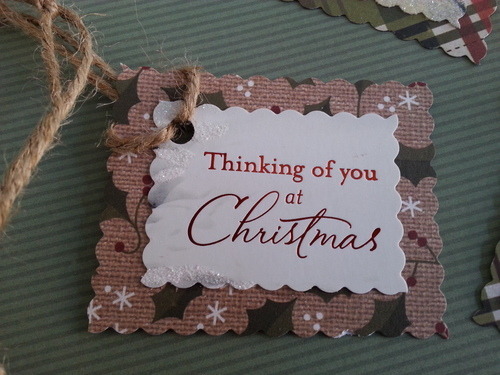 And of course old Christmas cards. Thanks M.A. it was so much fun. 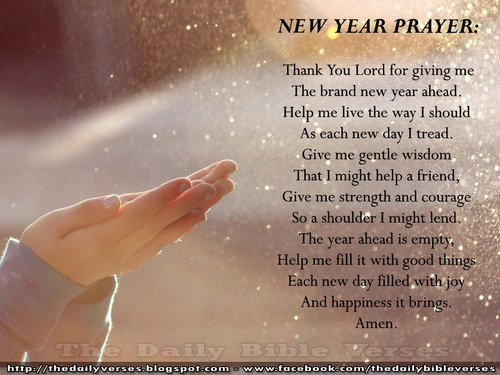 Well here we are a brand new year 2014 – I can’t believe a whole year has passed. 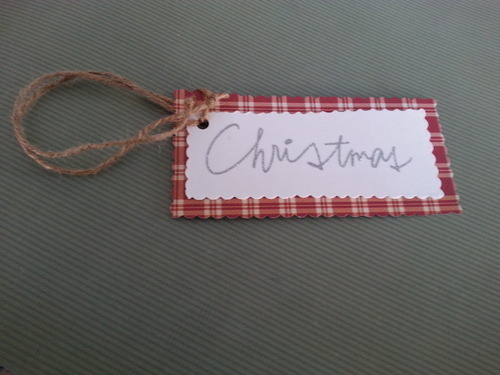 I have so much to do this year with my ETSY business and this wonderful blog. I love both of them – I am in full bloom with making jewelry, and feel I am becoming more and more creative. I remember when I was growing up, Mom & Dad would always say, You have this or that talent, and God wants you to use that talent, never did I think it would be making jewelry. So Mom & Dad I am using my talents. Thank you for teaching us that. Everyone have a healthy & Happy New Year.